Specific country info available here. Europe's got it all: soaring snowcapped mountains that take your breath away, ancient cities saturated in history, terraced vineyards spreading up steep hillsides, and refreshing alpine lakes that tempt you stop and take in the beauty of the land. A traveler's paradise that would make any normal human being want to linger. But not us. With 55,000 kilometers of road under our wheels, we were obsessed with the idea of making it back to where it all began one fine June day in 2006: Obernai, France. Such was our drive to complete our 55 country tour that we were almost oblivious to Europe's charms. We raced through the tiny green oasis of Slovenia to reach Italy where we puttered alongside lycra-clad speed demons on high-tech bikes who sneered at our ratty t-shirts and ripped shorts as they flew past. Romantic Venice, the city of tiny bridges and mysterious alleyways, got less than an hour on our itinerary--we didn't even have time to get lost. But, one thing we did make time for on a daily basis was a scoop of deliciously creamy gelato. We felt the indulgence was well-deserved after subsisting throughout Africa on a diet of rice and beans with the occasional treat being a bag of stale biscuits imported from India. Crossing into Switzerland we were faced with the final obstacle of our tour: the formidable Alps looming in the distance. At 2108 meters the St. Gothard Pass is one of the highest in Switzerland and we aimed to cross it. Often flanked by rivers and streams swollen with late spring snow melt, the road climbed steadily higher and the slight nip in the air turned into a downright chill. The snowline was almost within reach and we knew we were in for an adventure--I was already imagining myself slipping and sliding down an icy mountain road. With a sense of triumph we made it all the way to the picturesque town of Airolo on the southern flank of the pass. And then we were turned back. The road was still closed. Too much snow. Impossible to pass. Come back in July. What devastation. Almost 'home' and forced onto a train through the tunnel to cover the final 15 kilometers up and over the Alps. Just a few hundred kilometers remaining and the butterflies were doing somersaults in my stomach. I could hardly believe that we'd cycled all the way to Cape Town and back. Until the very end I fretted that something would stand in the way of reaching our goal. Perhaps my sturdy Koga bike frame would suddenly snap. Or maybe I'd be crushed by a ten ton lorry. Or worse yet some madman would slit my throat while I slept soundly in the tent. Suddenly we were crossing the border into France and I let out a little squeal of delight and satisfaction. Time to track down a boulangerie and remind myself what it's like to bite into a flaky croissant. As good as I remember, although the French are very disapproving of cyclists who plop down curbside to indulge in their fine food. Only a 100 easy kilometers from Basel to Obernai, Eric had assured me. Or maybe 110. Well I'm sure it's not more than 125. Okay, we should make it by 140 max. In typical fashion we were rushing right down to the last kilometer, anxious to make it on time for our rendezvous with the photographer from the local newspaper. Pedaling harder and and harder until finally my no-longer-so-little nieces were rushing out to greet us and their sparkling eyes and wide grins assured me that we'd been missed. We'd made it. Through parched deserts and hostile tribal zones. Through deep dark jungles and flooded roads where we pushed on, knee deep in mud. Through hundreds of chaotic African cities dodging kamikaze drivers and on the rare occasion stone-throwing teens. We'd cycled down lonely highways under big empty skies with the sun beating down on us. We'd cycled through driving rain for weeks on end and even battled our way through a snow storm. It hadn't been easy. Many times I was on the verge of giving up-- convinced that the joys weren't worth the many moments of suffering. But on every occasion someone popped into my life and made a difference. A family pulled over to offer us tea from a thermos as the snowstorm raged. Locals invited us in to warm up and dry off during a downpour. Laughing children called out greetings as we slogged on through the heat. Kind villagers presented us with fruits and snacks, giving generously in spite of their own poverty. Someone following our blog took the time to send us an encouraging email. Small things, really, but life changing nonetheless. 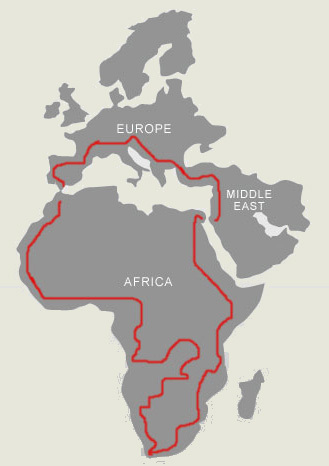 The Africa chapter of our tour officially came to an end on 14 May 2009 at 5:05 PM. Two years, eleven months and seven days on the road. 55, 236 kilometers pedaled and 55 countries visited. And just one bicycle: the World Traveller by Koga Miyata. It's been an unforgettable adventure. What next? Steady jobs, a comfy bed and a �600 espresso machine? Tempting yes, but... Since we're not entirely bankrupt and not quite ready to settle down to a stationary life, the obvious thing to do is keep on pedaling and exploring the planet. Where to you ask? Ushuaia, the capital of the Argentine province of Tierra del Fuego and the southernmost city in the world. But first we're going to spend some time discovering the good ole USA while pedaling from New York to my hometown Missoula, Montana. June 11th we touch down at JFK and my mission to convince Eric that there's more to America than fast food and fat people and that all my fellow citizens aren't gung-ho war-mongers will begin. But seriously, the US offers everything from adrenaline-charged cities to empty deserts and loads of friendly people who'll surely be queuing up to wish us a nice day. We can't wait to hit the road again. Not only are we excited about our new adventure, we're also excited about raising funds for a new charity, World Bicycle Relief. WBR provides access to independence and livelihood through The Power of Bicycles. While cycling through Zambia in 2007 we were able to see firsthand World Bicycle Relief�s work and the impact access to bicycles can have on developing countries. Bicycles are simple, sustainable and appropriate technology and we are proud to be linking up with World Bicycle Relief to help fight poverty. Our current fundraising balance is ZERO (insert sad face here). If you've enjoyed following our cycling adventure and have found the site useful or entertaining, please consider helping us in our efforts to raise funds for World Bicycle Relief. Your donations will go entirely to World Bicycle Relief and will help empower people through the power of bicycles. Thanks for your support.